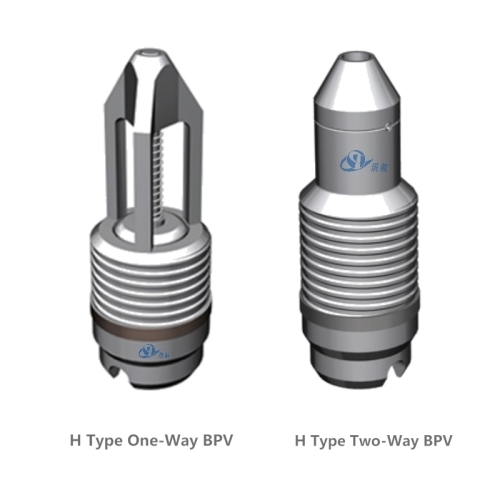 NB: A two-way check valve is designed to fit the same profile as the BPV. It holds pressure from both directions while allowing equalization when required and is used to test the tree and BOP assembly. A BPV is set in a profile provided in the tubing hanger using a special tool and lubricator assembly for threaded BPV models, or by slickline for profile set models. If during the life of the well it becomes necessary to remove the Christmas tree or repair the lower master valve, the back pressure valve can be reinstalled in the hanger without killing the well. The lubricator consists of a rod, which works through a yoke provided with two stuffing boxes. By closing the vent valve and opening the equalizing valve, well pressure acts on both the top and bottom of the rod. The rod can then be moved up or down by means of a friction wrench. Experienced operators can utilize the well pressure in moving the rod by manipulation of the valves. For setting, the running tool is inserted into the right-hand thread at the top of the valve, and then attached to the polished rod. When the valve has been lowered into the hanger, the rod is lowered so that the cross pin in the running tool engages in the slot on the top of the valve. Left hand (anti-clockwise) rotation is applied to insert the valve. Once the valve is fully seated, moving the rod up to lift the pin from the slot and continuing a left-hand rotation backs out the running tool. For removal, the pulling tool is attached to the rod and lowered to the valve. Right-hand (clockwise) rotation makes up the pulling tool. The rod is lowered into the slot on the top of the valve and continuing the right-hand (clockwise) rotation removes the valve. Tagged Back-Pressure valve, BPV, Cameron Type H BPV, Check Valve, one-way check valve, Petroline ABC BPV, tubing hanger, Tubing Hanger Flange, two-way check valve. Bookmark the permalink.